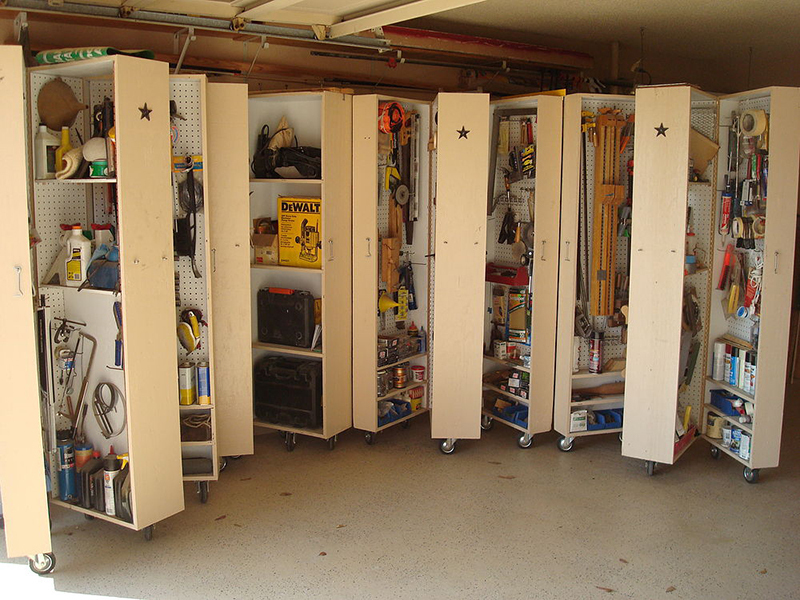 We’re getting into the spring spirit, which means it’s organizing time! 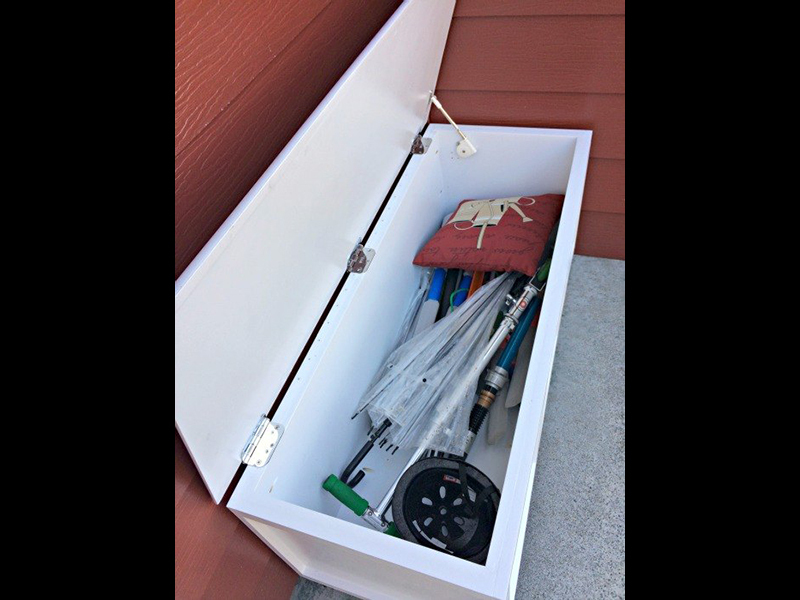 All the quick storage solutions and brilliant stowing hacks you need to bring order to your life are on Hometalk.com, a home and garden website packed with ideas and DIY’s to help you better your space. To get you started, here are 11 brilliant and budget-friendly organizing projects that will give you your most successful spring cleaning yet. Kiss your messy corners goodbye and get ready for a spotless space. 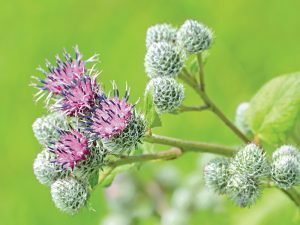 If you’re tackling other spring projects this season, whether they’re related to gardening, building, cleaning, or crafting, check out Hometalk.com before you start, for tons of suggestions, ideas, and inspirations. 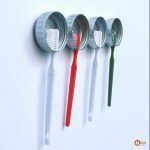 Protective and pretty toothbrush holders are a plus for any bathroom space, but who wants to spend extra on them? That’s why Ama over at Ohoh Blog devised this bottle cap hack for a budget solution. Start off with a few clean 20L bottle caps. 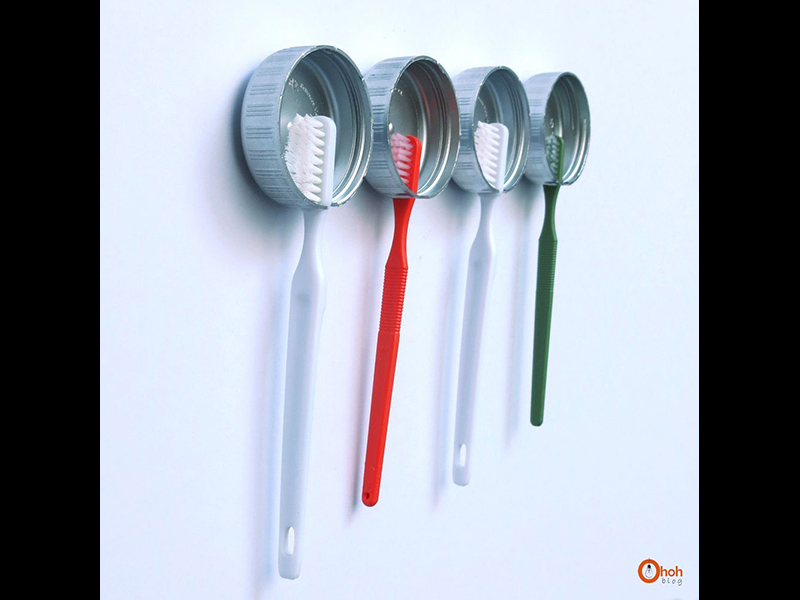 Using a utility knife, cut a notch in one side large enough to fit the thin neck of the toothbrush. To add some style, spray paint the caps with a non-toxic paint in a color that matches your bathroom. Once the caps are completely dry, add a small piece of velcro to the back of each cap and line them up on your bathroom wall. 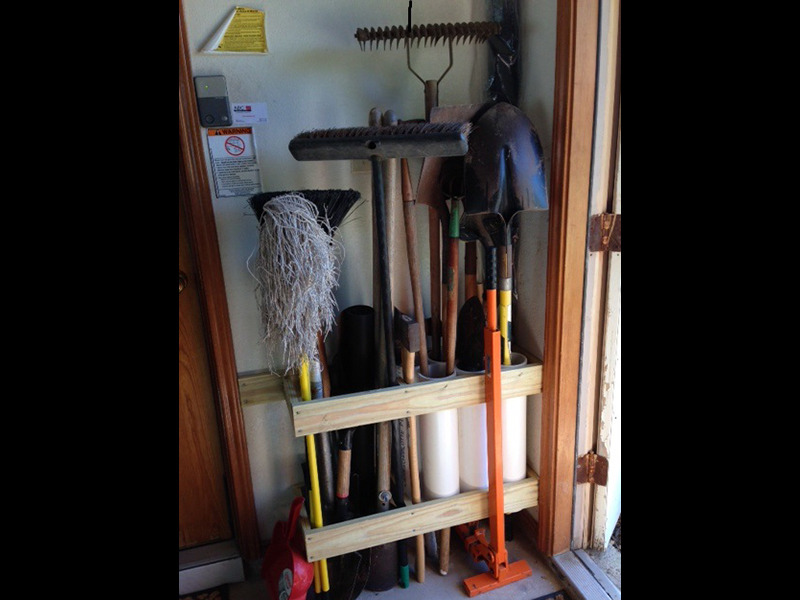 You know that corner where you store all of your gardening tools against the wall until it becomes hazardous to walk by? 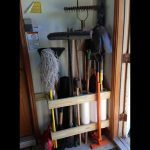 Instead of letting your tools get to that point, keep garden tools in perfect order with this homemade PVC organizer by savvy DIYer Ouina. First, cut a length of 4” wide PVC pipe into six lengths of 20 ½” each. Next, build a 2-level frame to hold your PVC pipes. The frame should be made from 1”x4” planks of treated lumber. Place a brace down the middle of each level, to hold the pipes on one side and leave general standing storage space on the other. Make sure that your frames are wide enough to fit the pipes aligned in a zigzag arrangement. Attach the frames to studs in the wall, placing the bottom frame 9 ¼” off the ground (from the bottom of the frame), and the second frame 8” above that (from the bottom). 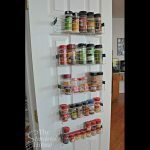 If you’re lacking kitchen storage but you’re short on space to squeeze it in, this roll-out kitchen pantry from home bloggers Erin and Dan at DIY Passion is exactly what you need. Start by measuring the space you’re trying to fill and cutting pine boards for the box frame and shelves to fit. You’ll want dowels to act as guards for your shelves and a sheet of masonite for backing. First, put together the frame and shelves. Drill holes for the dowels and add one to each shelf. Once your frame is together, add 4 casters to the bottom, and then paint. Before adding your masonite backing, you might want to paint it or add decorative wall paper, to give your pantry a pop of color. Add your backing using a nail gun, and finish your pantry off with a large drawer pull in the side, so that it can easily roll out and in. We all love free pallet projects, especially when they help bring order to chaotic spaces, and blogger Lindsay of My Creative Days is no exception. She turned free pallets into a sturdy and stunning wall organizer. She cut pallet planks free using a circular saw, then used those pieces to build 4 boxes long enough to fit her wall space. The height of each box is the height of the pallet plank. Then, she used the two long side posts from the ends of her pallet as the posts for the organizer. She screwed the boxes into the side posts so that they were flush with the back of the pots. After painting them, she was able to put these against the wall and organize away. 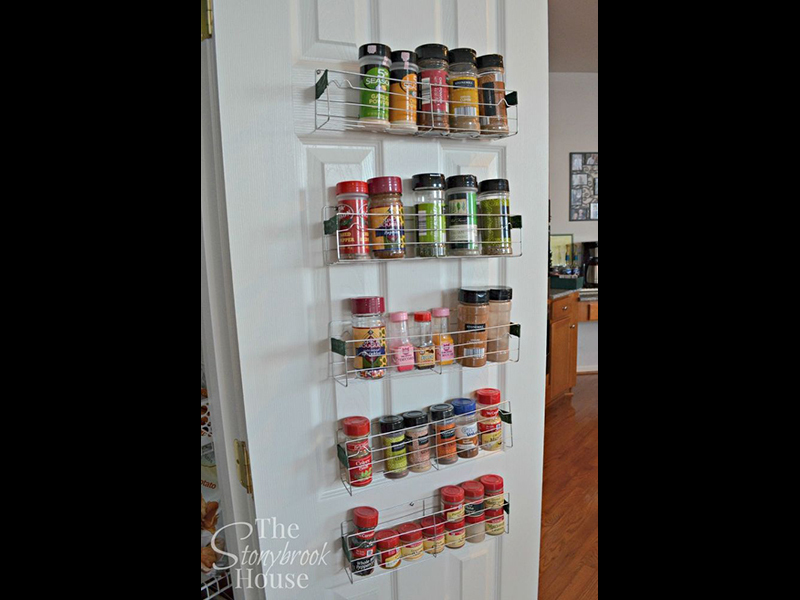 Free up shelf and counter space by storing spices on the back of your pantry door or on a free wall, with this dollar store hack from blogger Lori over at The Stonybrook House. 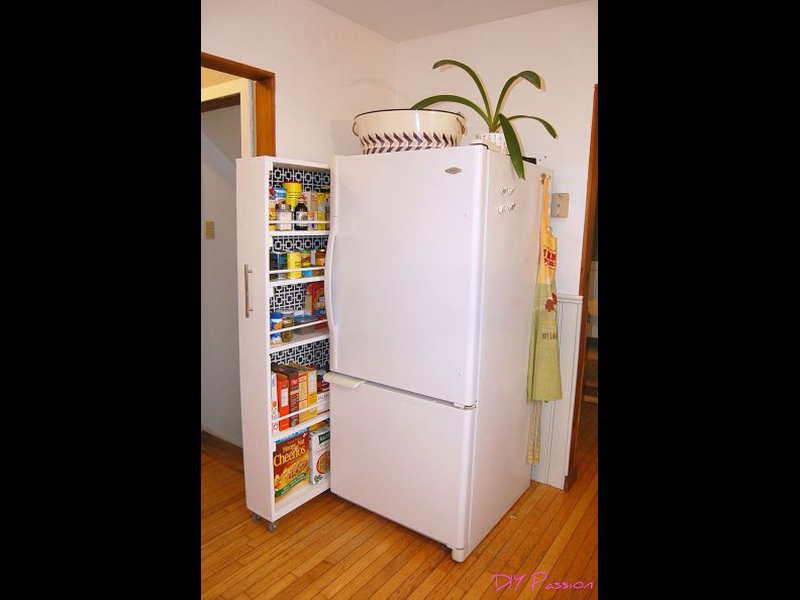 Use pliers to bend the little looped legs of inexpensive cooling racks so that they lie flat. Next, bend the rack up at the fourth wire across and then again at the sixth wire, to create a U-shape with one wire down the middle of the base. Use a strong ribbon to bridge the sides and secure it with hot glue. Then, just hang it up and add your spices! 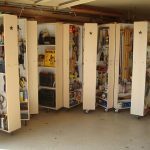 These 3-section rolling cabinets turned homeowner Richard’s messy garage into a supremely organized space, and they can do the same for you! Start by cutting the frames for the three different parts. Overall, the cabinet is 6’ high, 23” wide (when closed), and 21” deep. The middle section is 10″ wide, and the two side sections are each 6″ wide. The center section should be open on both sides, but each of the side sections should have a back, like an ordinary shelf. Before you assemble your sections, cut grooves for shelves with a dado blade. Add 1/2″ X 1″ pine strips around the perimeter of each section to act as spacers, and then put in pegboard on the inside walls of the middle section and the back wall of each of the side sections. 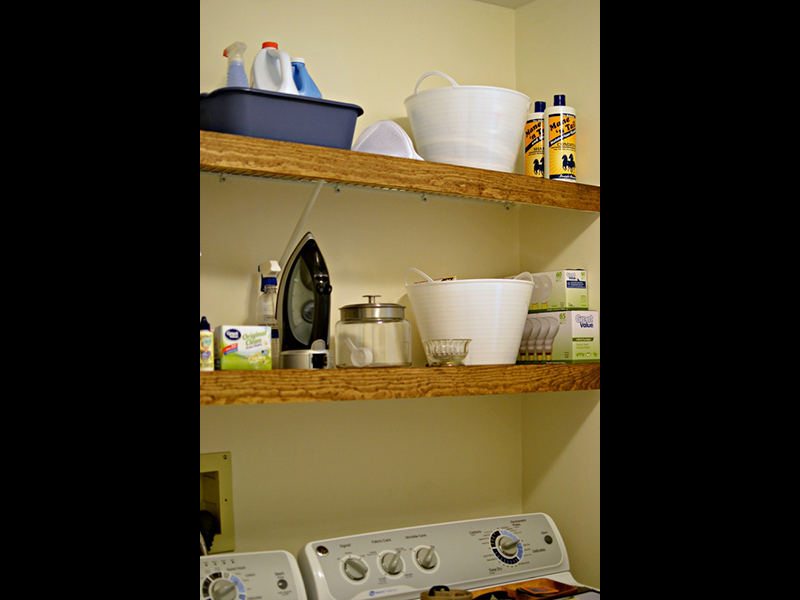 Add a peg board divider 3′ up from the bottom in the center section, to create storage on both sides of the center section. Connect the sections along the back with two piano hinges. 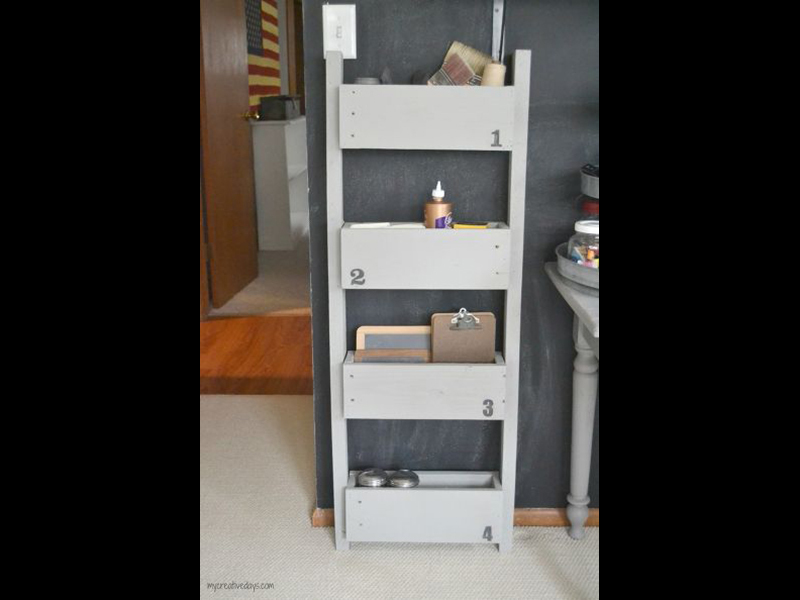 Put two casters in the front and back of every section and then add your shelves. Paint if you’d like and then fill your cabinets with all of your tools. 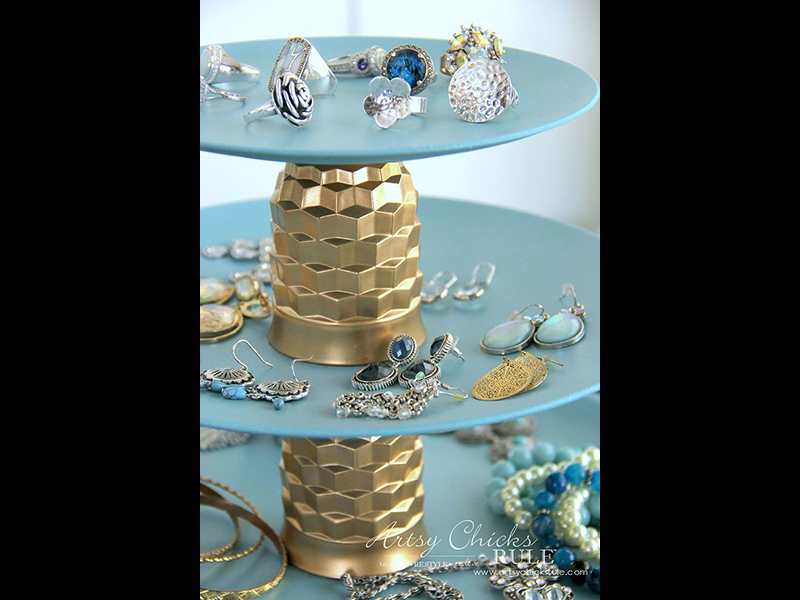 Create custom jewelry storage using tableware from the local dollar store, like Nancy, the blogger at Artsy Chick Rules. Just spray paint two glasses and three plastic plates — small, medium, and large — in your choice of colors. Then, using E6000 adhesive, glue the first cup upside down in the center of the large plates. After that, do the same thing for the second cup and the medium plate. 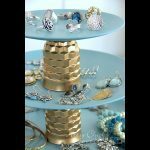 Once those are dry, add a ring of glue to the base of each cup and stack the medium plate first, then top the whole thing off with the smallest plate. (When using this glue, make sure you’re in a well ventilated area because it’s strong stuff!) Now you’re ready to load up your layers with pretty, sparkly accessories! 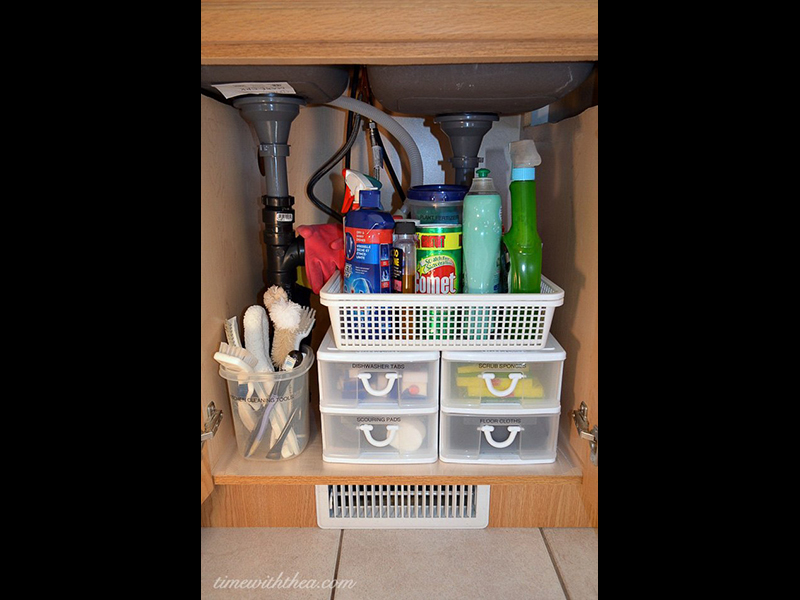 You probably didn’t even know that that black hole-like cabinet under your kitchen sink could be functional, but home style blogger Thea from Time with Thea found a way to do it with inexpensive storage containers. 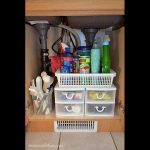 She laid down clear plastic shelf liner for a clean surface, then added two plastic 2-drawer units and labeled each drawer with the different cleaning supplies and contents. Beside the drawer units, she added a tall plastic bin to hold brushes, scrapers, and scrubbers. For cleaning sprays and soaps, she added a shallow plastic basket on top of the drawers. That’s it – say hello to easy cleaning from here on out! Coral all of your miscellaneous porch clutter by adding clever seating that doubles as storage. Vineta, blogger of The Handyman’s Daughter, created a charming storage bench that’s 17 ¾” high, 19 ¼” wide, and 4’ long, with a wide, flat lid that’s perfect for perching on. She assembled the box with pocket holes and screws, so that it would be sturdy enough to survive outdoors. To spruce it up, she wrapped the bottom and top of the box with white 1”x2” trim boards, and framed the front of the bench with trim as well. Vineta added the trim using a nail gun, and then filled in the cracks with caulk. She painted the box and cover with a classic white hue before putting them together with three hinges along the back. 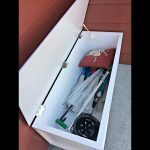 The finished creation is the perfect place to store outdoor tools, toys, and anything else, and it adds some pretty porch seating, too. 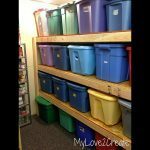 If your garage has plastic bins stacked ceiling high, the brilliant blogger behind My Love to Create has a DIY shelf design that can save you a serious mess-induced headache. Mindi started with ten 8’ long 2×4’s and four pieces of 8’x2’ Oriented Strand Board (OSB). She cut four supports for each frame from 2×4’s at 21” long each. She used two 8’ 2×4’s and four support bars to create each shelf, with two support bars at the ends and two towards the middle. Next, she simply screwed a piece of OSB to the top of each shelf, to create a sturdy surface. 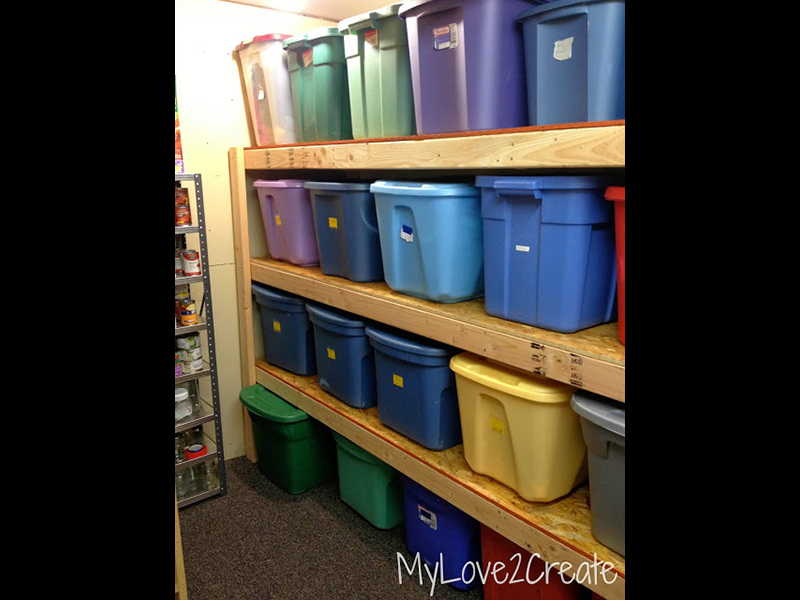 She used the bins plus a thick plank to keep the shelves standing as she built. Lastly, she connected the shelves to four 63” long legs, leaving 21” between each shelf to fit standard sized plastic bins. 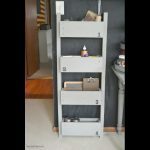 For blogger Melissa of This Girl’s Life Blog, wire shelving was practical storage in her rental but it was not at all attractive, so she came up with a clever way to disguise it. All she needed for this project was a 4’×8’ sheet of ¼” plywood and a 1”×4” board. First, she and her husband measured the depth and length of their wire shelving and then cut it out of the plywood sheet. Once the plywood pieces were cut, they attached the 1”×4” board on the end, creating a lip to hide the ugly white wire. Before putting up the shelves, they stained it a dark color and gave it ample time to dry. 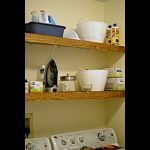 Then, they simply slipped the wooden cover over the wire shelving and instantly got the look of high-end floating wood shelves! EDITORS’ HAT TIP: TNP editors are proud to say we’re hooked on the ever-growing hometalk.com community and all that its members offer. 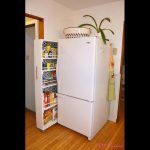 For more talk, more doing and oodles of great DIY ideas and inspirations, visit hometalk.com and sign up for its daily does of thrifty ways to improve your homes and gardens.